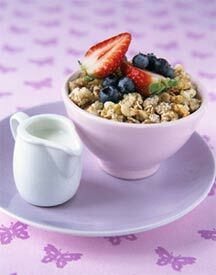 Oats are considered a fitness power food, and granola is a tasty way to get your daily oats. The problem is that most granola recipes are loaded with sugar. You could buy a low-fat or low-sugar prepackaged granola at the store, something like a Bear Naked Granola, but at nearly $6 a bag, it’s more economical to make your own. Best of all, this particular granola recipe is wicked easy to make. If you aren’t crazy about nuts, you can substitute dried fruit like raisins, dried cherries, blueberries, cranberries or even dried apple slices or banana chips. Add these after the granola has been cooked and cooled. This is Risa (Clayton’s wife). I found your side searching for homemade granola. Clayton just saw it and told me it’s your site. Wow. Nice! You do well in search. I’ll try your recipe. Talk to you soon. this looks delicious but I think the sugar content may be off? When I plug it into my online recipe calculator, it says there’s 8 grams of sugar per serving, which sounds more accurate. And in my family a serving is more lik 1/2 c. which brings the sugar up to 15 grams…way too much for a healthy snack. Perhaps I’m missing something? I too think that there must be a typo or two in this recipe. There’s way too much moisture for the amount of oats. I would cut the honey back by 1/4 cup to start, cut the oj to a couple of tablespoons and add orange zest and 1/3 cup of oil (vegetable, grape seed, almond oil would all be good choices). This is GREAT, I agree that the sugar is a little high…but I used the Oj made by Tropicana that is sweetened with the stevia, to lower the sugar, and left out the cocoanut. I used the full 1/2 cup of honey and it was fine. Although the sugar is a little high still, its a MUCH healthier snack than anything with refined sugar in it! YUMMY! The Low-fat Low-sugar Vanilla Orange Granola is tasty. However, I reduced the cooking time by about five minutes since the pecans were burning. Next time I will add them in with 15 minutes to go. I was pleasantly surprised to find that there wasn’t too much moisture and the granola crisped up upon cooling.